I’ve been meaning to make a blog entry for quite some time now on this subject, and I’m finally getting around to it. I’ve been fascinated that media and fan perceptions of the move to the Mountain West Conference and schedule strength increases from last year to this year appear to be a bit out of touch with reality (in my statistically-based world, anyway). Much has been made of Utah State entering the Mountain West Conference football conference this coming season. Most media members, fans (including our own), coaches (including our own), and other analysts have said that the move will be a tough one. Utah State will be facing a tougher conference and tougher opponents. How will they fare? Surely they won’t be able to achieve similar successes to what they did in 2012 in the “weak” Western Athletic Conference. What is this opinion based on? I think it is based merely on image and historical biases. Is it true? That is what this article will focus on. As a frequent contributor to the USUFans.com message board, I was intrigued this past week in reading a few threads on this very subject. Many fans (including the majority of Aggie fans posting) said repeatedly how this year’s schedule and this year’s conference will be tougher than last year’s. What was this based on? Many posters alleged that it’s incredibly difficult to compare teams that haven’t faced each other in direct competition. This may be true, but there are statistical formulas that do a great job of comparing disparate teams based on a variety of factors, and can predict outcomes with pretty good accuracy. That’s what I’m going to focus on to disprove the notion that the Mountain West Conference will be a huge step up in difficulty. I’ll also disprove the notion that the 2013 schedule will be much more difficult than the 2012 schedule. In fact, it could (and probably should) be argued that the WAC was a stronger conference than the MWC last year, and that the 2012 schedule was a stronger schedule than the 2013 schedule. Jeff Sagarin is a statistical guru who has a several rating formulas that he uses to rate and rank teams on their relative strength. He uses his formulas to rate teams in NCAA football and basketball as well as a variety of other sports. 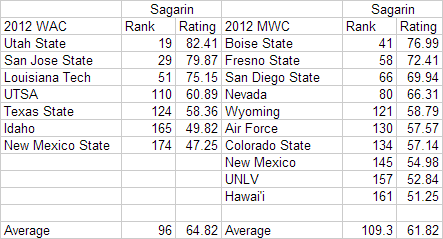 So the average Sagarin rank for WAC teams was 96 compared to 109.3 for Mountain West Conference teams. It’s also interesting to note that the top 3 teams in the WAC were rated much higher than the top 3 teams in the MWC when compared side by side. The bottom two WAC teams were rated quite low (lower than any MWC team), but overall the WAC should be considered the stronger conference of the two. Now, there are many people who prefer to rely on the hats-in-the-mall theory, conference reputation, or the “eye-test” to determine the strength of a team. 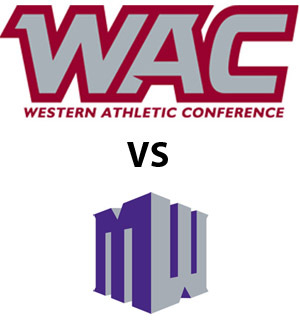 So let’s look at head to head contests last year between the WAC and MWC. Obviously not all WAC teams played all MWC teams, but in the games that were played the WAC won more often than the MWC did last year. Now let’s take a look at Utah State 2012 Schedule vs our 2013 Schedule. Many have stated that this year’s schedule will be stronger than last year’s. I didn’t buy into that theory and with a little help from Jeff Sagarin was able to back up my initial thoughts. The average rank of our 2012 opponents was 99.83. The average rank of our 2013 opponents (at the end of the 2012 season) was 101.17. Does this mean that this year’s schedule will end up weaker than the 2012 schedule? Not necessarily. But based on the information that we have it looks like this year’s schedule will be slightly less difficult (on average) than last year’s schedule. Let’s dig a little deeper. Both games played on the road. Wisconsin ended the season ranked 23rd by Sagarin, while USC ended the season ranked 33rd. Last year we had #26 BYU on the road while this year they are coming to Romney Stadium. Last year’s BYU game was a battle of defenses with BYU pulling out a 3 point victory. Utah State should be favored in this year’s game. Especially at home. Against Utah, the Aggies won a hard fought battle in overtime by 7 points. This year’s game will open the season in Salt Lake City, and early Vegas lines have Utah as the slight favorite. 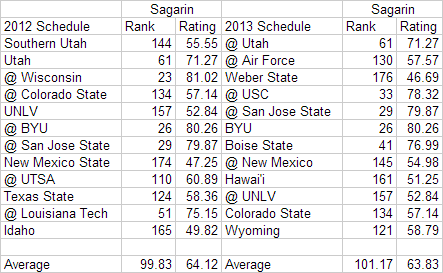 Using the end of year Sagarin Predictor ratings from 2012 gives Utah State a 9.26 point edge if the game were played on a neutral field. The home field advantage usually accounts for a 3-4 point difference, so based on where each team ended the 2012 season, Utah State should be favored by 5-6 points this year. Why is the Vegas line different? Well, that’s the topic for another post, but basically Vegas tries to set the spread to where they will get 50% of their bettors to bet on each side of the spread. Perception, BCS Bias, coaching changes, player changes, injuries, and probably even the hats-in-the-mall theory all weigh in to where lines are set. I think picking the Aggies to cover is a good bet this year. As far as FCS foes go, Southern Utah was ranked quite a bit higher last year than Weber State was. Either way, this should be an easy win for Utah State. In short, based on last year’s results, all three games this year should equate to wins for the Aggies. Last year we faced each of the top WAC teams on the road in #29 San Jose State, #51 LA Tech, and #110 UTSA. This year we face San Jose State on the road again, but have Boise State (41) and Wyoming (121) at home. It’s also interesting to note that outside of Boise State, and SJSU, the next highest MWC team we face was rated #121 in the nation last year. That bodes well for our conference record this year if we can get past the Spartans and Broncos (a big if). Overall, I think it’s very safe to say that this year’s schedule is easier than last year’s schedule. While looking for some highlight of some of our new football signees I came across this interview of one of the most interesting stories this recruiting year. Hayden Weichers, a 6-0, 170 lb wide receiver from Bingham High School comes from a long line of BYU Cougars. He had committed early to BYU, but was recruited heavily by both BYU and Utah State. In December Hayden decided to decommit from BYU to sign with Utah State and was instantly a fan favorite in Logan. Here’s an interview with Hayden filmed yesterday on National Letter of Intent day. Enjoy. And just for good measure, here’s a nice highlight clip of Weichers. For those who missed it, here is some footage from the interview with Utah State’s new Offensive Coordinator Kevin McGiven. Interview took place at halftime of the Utah State vs. San Jose State basketball game on January 11, 2013. For those of you who missed it, here is some footage of the 2012 Utah State Aggie Football Team at the Spectrum for the Football Appreciation Night. Coach Wells and the team was available for autographs before the game and came out at halftime to show their WAC Championship and Famous Idaho Potato Bowl trophies. The Aggies have done it! Utah State is officially the champion of the 2012 Famous Idaho Potato Bowl. The perfect icing on the cake to a historic outright WAC Championship and 11-2 Season. For those of you who missed it (it wasn’t shown on ESPN), here is the trophy presentation from today’s game. Check out the latest Chuckie Keeton interview from December 2, 2012 on Channel 2, Talkin’ Sports with David James. Chuckie Keeton talks about the 10-2 season, WAC Championship, Gary Andersen staying at Utah State, and second straight trip to the Famous Idaho Potato Bowl. Chuckie Keeton talks about the 10-2 season, WAC Championship, Gary Andersen staying at Utah State, and second straight trip to the Famous Idaho Potato Bowl on Talkin’ Sports with David James. I had a request for this video clip shortly after Utah State’s victory tonight. Thought I’d put it on youtube for posterity. Enjoy. Gotta put a huge shoutout to the folks at KSL who put this together. It’s a great highlight video on our recent victory over the Utes. Matt Glade also put up a nice writeup and some photos to go along with the video.